Yes I did make cheddar scones. I know, I’m shocked too! Occasionally, my baking results surprise me. It’s no secret that I like to tweak recipes, I can’t help it. I’m always trying to either cram more things in or take things out. Often, I find baked goods too sweet so I always fiddle with the sugar content. I also try to add ground flax, ground almonds or something else that’s a little heartier in to the recipes to see if I can buff them up a bit more. Sometimes, I make things happen and don’t even realize I’m doing it (like the time I misread a recipe and added 1 cup of milk instead of the ½ cup recommended and yet the cake was delicious!). They don’t always turn out but at least I can say I tried. Lo and behold, a success story: I made cheddar scones! Pardon me? Yes, you heard correctly. 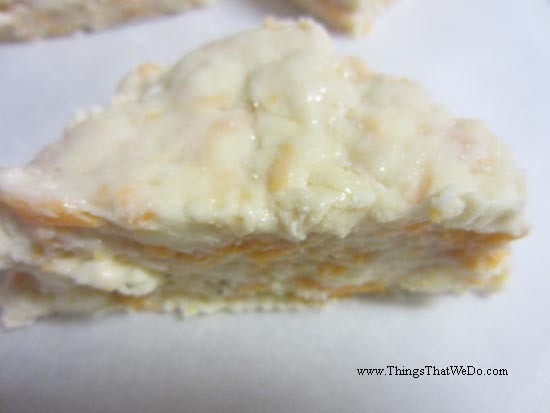 I made cheddar scones from a basic scone recipe that I was familiar with. The family loved them and they suited our taste buds – cheesy but not insanely so with subtle flavours that made us happy as can be. I mean, really, that’s the best part about baking – making flavours that work for you! 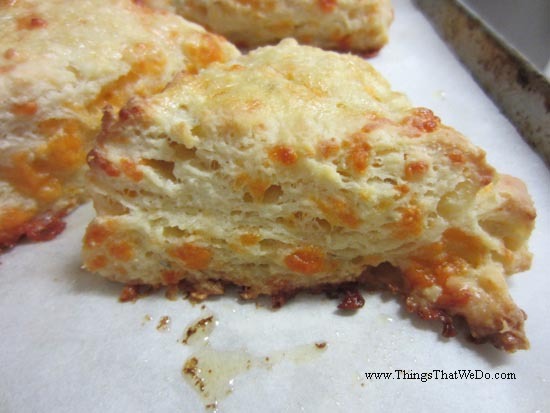 So, what ingredients did I use to make these cheddar scones? 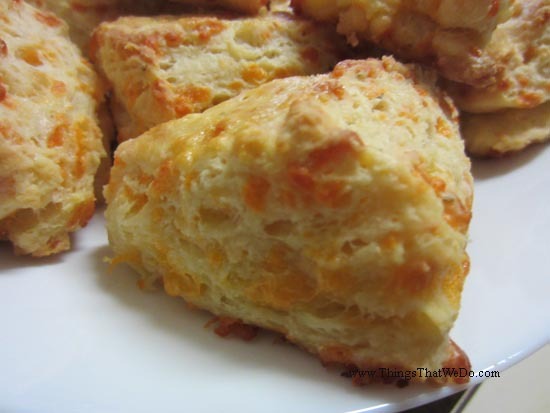 And just how did I make these cheddar scones? In a large bowl, combine and mix the flour, baking powder, sugar, salt, herbs and spices. This is your lovely dry mix. Here’s the part where you’ll have to move a little faster. I find my scones turn out best when the ingredients stay cold. 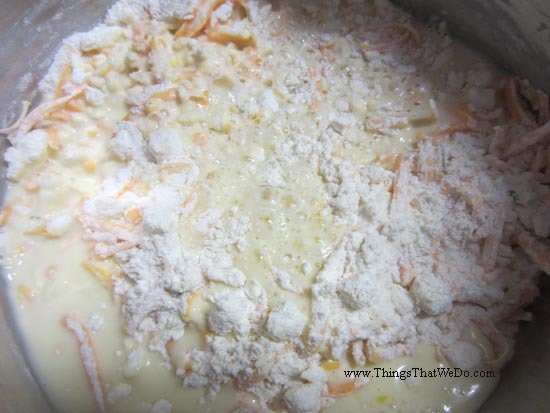 Take out your cold butter and drop it into the dry mix. 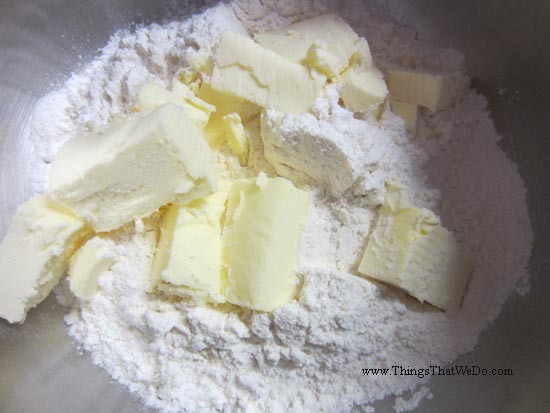 Use a pastry blender and cut the butter into the dry mix until you get a nice fine crumbly mix. Get your delectable cheddar cheese. 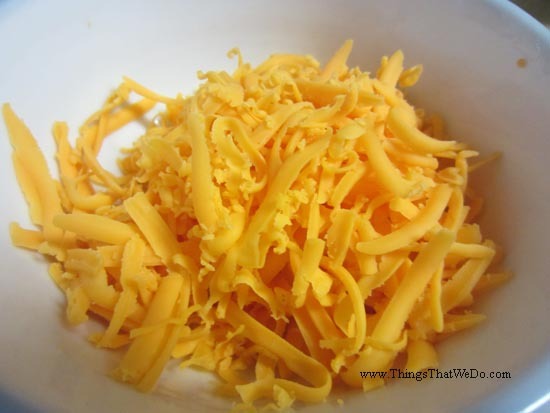 Add the cheddar cheese into the dry mix and stir it all together. 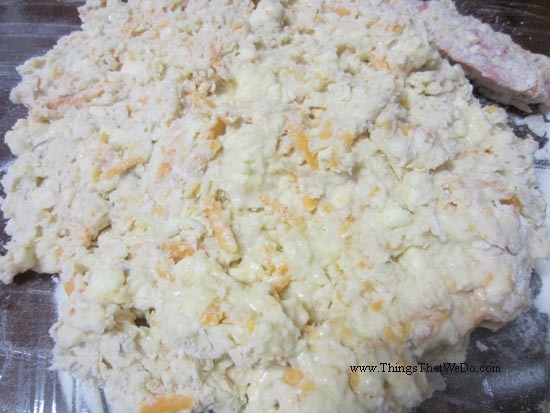 Make sure the cheese is separated and not all clumped together. In a measuring cup, measure ¾ cup milk. Add the egg yolk into the milk and beat the two together. 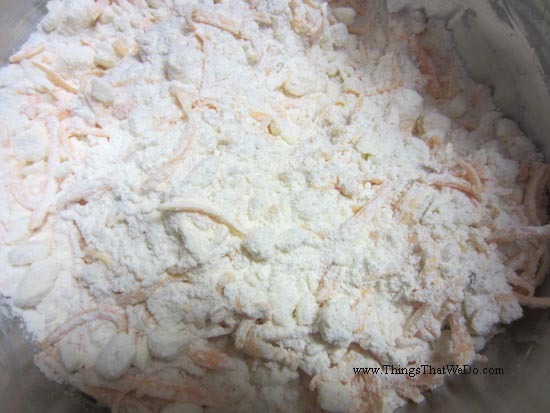 Add your wet ingredients to your dry ingredients, folding the mix together until combined. It’ll look a little wet and clumpy. That’s how you’ll know you’re on the right track. 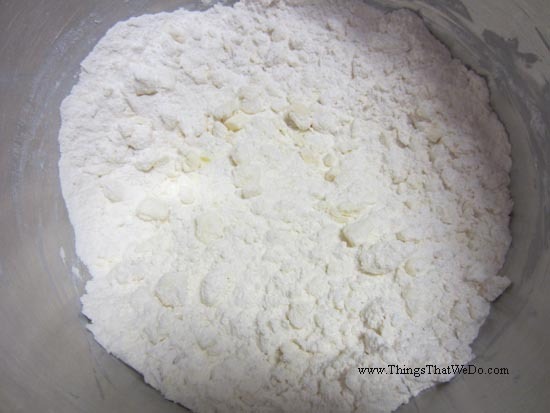 Turn the dough mixture onto a lightly floured surface. Place a little extra flour to the side in case you need it. To prevent your hands from warming up the dough, I like to use a spatula to knead/fold the dough. I push down and flatten with the spatula moving around and using the floured surface to prevent it from getting sticky. You’ll want to fold the dough in on itself about 5 – 8 times to make all those cool layers you see in scones. Use the spatula and pat the dough into a round shape about 8 inches wide. If you can’t get it to the shape you want, try to flatten the dough until it’s about 1 – ½ cm thick. With a floured knife, cut the dough into 8 even pieces (or about as even as you can make it) and place them onto a parchment lined baking sheet. Brush the tops of the scones with a little egg white. If you’d like, you could even sprinkle a little coarse sea salt on top. I didn’t, but you could! Bake at 375 degrees for about 22 – 25 minutes (depending on those finicky ovens and baking sheets). Your scones should rise and turn a lovely golden colour. 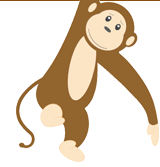 All you have to do after that is just enjoy! 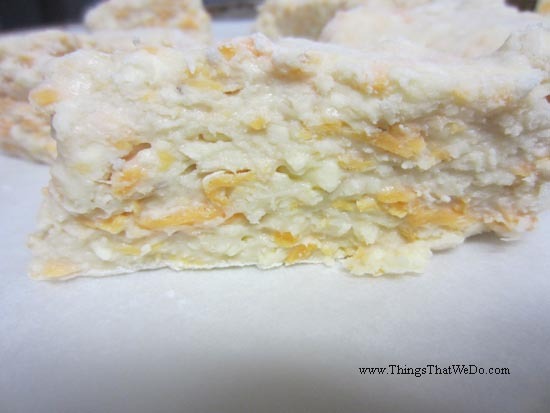 Take a look at these cheddar scones? Honestly, I look at those images and I’m still shocked. The layers turned out well and the scones tasted great. They were soft, fluffy, and light. 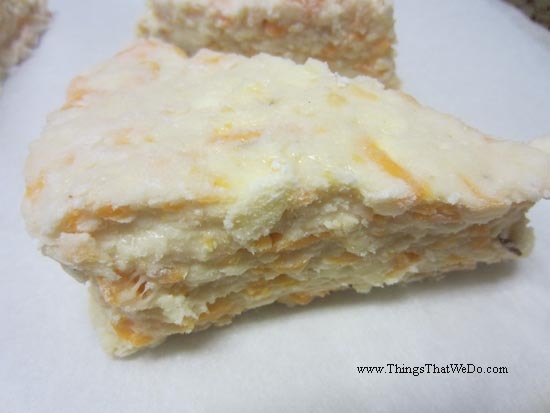 With only ½ cup of butter, they were well balanced even with the addition of the cheddar cheese. These cheddar scones turned out so well and now that I’m not so afraid of making them, I’ll probably try other versions of this cheddar scone with different herbs and spices. Who knows, I may become an expert scone baker one day!